PortableApps.com is providing portable software solutions allowing you to take your favorite software with you. Its portable software work on any portable storage device (USB flash drive, iPod, memory card, portable hard drive, etc). You don't have to install anything on another computer. 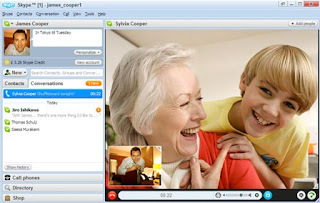 Skype is also packaged as a portable application by PortableApps.com so you communicate on the go. Skype Portable doesn't require additional software on the PC and it works as you move computers and your drive letter changes. When your USB flash drive, portable hard drive, iPod or other portable device is plugged in, you have access to your software and personal data just as you would on your own PC. * Call phones and mobiles, send SMS. * Forward calls to a phone when you’re offline.